ING has committed to procuring 100% renewable electricity by 2020 for all buildings in which we operate worldwide as part of the RE100 initiative. ING joins other influential global companies also part of this initiative, who wish to signal to private business the importance of combating climate change. With the UN Climate Change Conference (COP21) now taking place in Paris, ING is proud to once again show our commitment to achieving a more sustainable world by joining this initiative. ING has been climate neutral since 2007 by offsetting emissions. We’ve also set targets to reduce our CO2, waste and water footprint all by 20 percent by 2020. This is part of ING’s Environmental Programme, established to reduce our direct environmental impact, which includes our operations and buildings, IT systems and business travel. Joining the RE100 initiative is in line with this. The renewable energy ING will use encompasses electricity generated from renewable sources such as wind, solar power, geothermal, hydropower, and biomass. Municipal solid waste (MSW) is also considered to be a renewable energy resource. The use of nuclear power is not included in our renewable electricity programme. The private sector accounts for around half of the world’s electricity consumption, according to RE100. Switching this demand to renewables will accelerate the transformation of the global energy market and aid the transition to a low carbon economy. RE100 is led by The Climate Group in partnership with CDP, as part of the We Mean Business coalition. 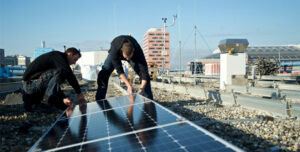 Hey Buddy!, I found this information for you: "ING commits to renewable electricity for all buildings worldwide". Here is the website link: https://www.duurzaam-ondernemen.nl/ing-commits-to-renewable-electricity-for-all-buildings-worldwide/. Thank you.